Before they meet again in Vietnam on February 27-28, there’s growing pressure that they forge a deal that puts them closer to ending the North Korean nuclear weapons threat. Kim may be willing to dismantle his main nuclear complex. The US may be willing to cough up concessions, maybe remove some sanctions. The question, however, is whether what’s on offer will be enough for the other side. After a September meeting with Kim, South Korean President Moon Jae-in told reporters that Kim promised to dismantle the complex if the United States takes unspecified corresponding steps. Stephen Biegun, the US special representative for North Korea, recently said that Kim also committed to the dismantlement and destruction of North Korea’s plutonium and uranium enrichment facilities when he met visiting Secretary of State Mike Pompeo last October. There is worry among some, however, that the complex’s destruction won’t completely dispel widespread skepticism about North Korea denuclearisation commitments. It would still have an estimated arsenal of as many as 70 nuclear weapons and more than 1,000 ballistic missiles. 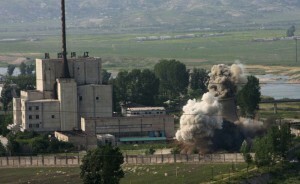 North Korea is also believed to be running multiple undisclosed uranium-enrichment facilities. “We could call (Yongbyon’s destruction) a half-deal or a small-deal,” said Nam Sung-wook, a professor at Korea University and a former president of the Institute for National Security Strategy, a think tank affiliated with South Korea’s main spy agency. “It’s really an incomplete denuclearisation step” that matches past tactics meant to slow disarmament steps so it can win a series of concessions. “For North Korea, abandoning the Yongbyon complex is a fairly big (negotiating) card… so the North will likely try to win some economic benefits,” said Chon Hyun-joon, president of the Institute of Northeast Asia Peace Cooperation Studies in South Korea. North Korea has since complained about the lack of action by the United States, saying it already took disarmament steps, and returned American detainees and the remains of American war dead. The US for its part suspended some of its military drills with South Korea, a concession to North Korea, which calls the exercises dress rehearsal for invasion. Kim and Moon agreed at the first of their three summits in 2018 to settle an end-of-war declaration. Moon said last month it could ease mutual hostility between Washington and Pyongyang, and accelerate North Korea’s denuclearisation. But some worry that a declaration ending the Korean War, which was stopped by an armistice and has yet to be replaced with a peace treaty, might provide North Korea with a stronger basis to call for the withdrawal of 28,500 US troops in South Korea. A North Korean declaration of its nuclear programme would provide invaluable information, if verified by US intelligence, to Washington and others. It would offer looks at hidden nuclear fuel facilities and missile deployments, which is why Pyongyang has been reluctant to provide it. According to South Korean and other assessments, Yongbyon alone is estimated to have 50 kilograms (110 pounds) of weaponised plutonium, enough for six to 10 bombs, and a highly enriched uranium inventory of 250 to 500 kilograms (550 to 1,100 pounds), sufficient for 25 to 30 nuclear devices. Because of the difficulty involved, Trump may want to focus on the North’s long-range missiles, which could, when perfected, pose a direct threat to the US mainland. But such a partial deal would rattle many in South Korea and Japan, which are well within striking distance of North Korea’s short- and medium-range missiles.